We’re here to bring you the latest proven treatments for your sleep-related problems. 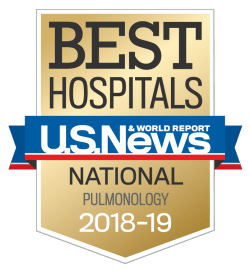 We consult with our Comprehensive Lung and Breathing Program team to decide on the best care for you, including diagnosis of your condition, non-surgical therapies and the surgical intervention you may need, not found many other places locally. Better sleep is not far away. It takes a collection of different specialists to properly diagnose and treat sleep patients. This “multidisciplinary” approach is a hallmark of our Comprehensive Lung and Breathing Program in metro Denver. We offer the following testing options for sleep disorders. Talk to your primary care provider or call our clinic directly to get a referral for a sleep study. Drug-induced sleep endoscopy (DISE), a test where a flexible telescope is inserted through the nose to figure out exactly where the obstruction is happening during sleep. Continuous positive air pressure (CPAP). The first line of treatment for obstructive sleep apnea (OSA). CPAP involves a mask that uses air to open a patient’s airway so they can breathe better during sleep. Our team can help educate you on the different options and comfort settings of CPAP machines to find the best option for you. Cognitive behavior therapy (CBT). This method for treating insomnia involves learning to control the worry and negative thoughts that keep you from falling asleep. The treatments below are offered through our Ear, Nose and Throat practice. The Inspire device, which is implanted under the patient’s skin, looks and functions somewhat like a pacemaker – for breathing. Inspire. This therapy is designed for patients with moderate to severe OSA who haven’t had success with CPAP. 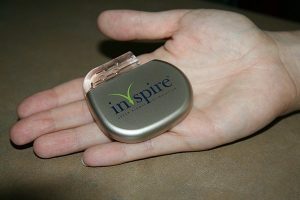 Inspire consists of a breathing sensor and stimulator with a small battery that’s surgically implanted and delivers a mild electrical charge to key muscles to keep your airway open during sleep. Sleep surgery. For OSA patients with documented CPAP failure, sleep surgery may be an option. We do a comprehensive airway evaluation to pinpoint where the obstruction is happening, and then offer a personalized approach to determine if surgery is right for you.